Mini Me Cashmere, a new cashmere collection for mothers and children for this Fall/Winter season! A creatively intense season: we have in fact introduced 3 new yarns – Cashmere and Sugar Cashmere that we talked about here, and Alpaca Brush – and created many collections and collaborations. But still many surprises await you, like the new Mini Me Cashmere capsule collection that we are introducing now! How was the Mini Me Cashmere capsule collection born? 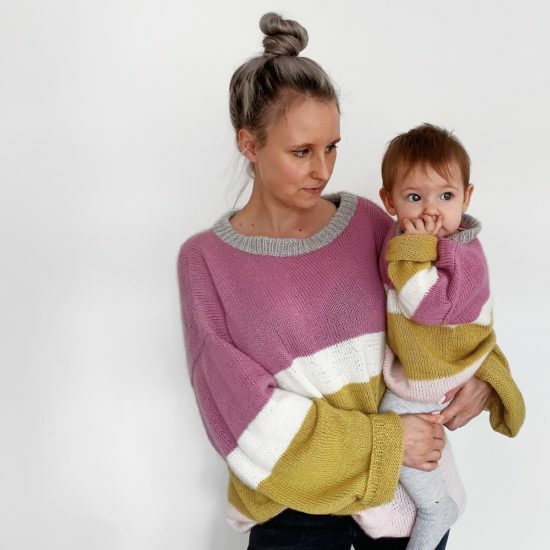 Mini Me Cashmere was born from the collaboration with the knitter @Katandleni and it’s inspired by her world of delicate colors, simple and elegant lines and the choice of precious yarns. And it is mainly inspired to her and her daughters, to be able to wear together, mother and daughter, a comfortable, soft and extremely warm sweater. 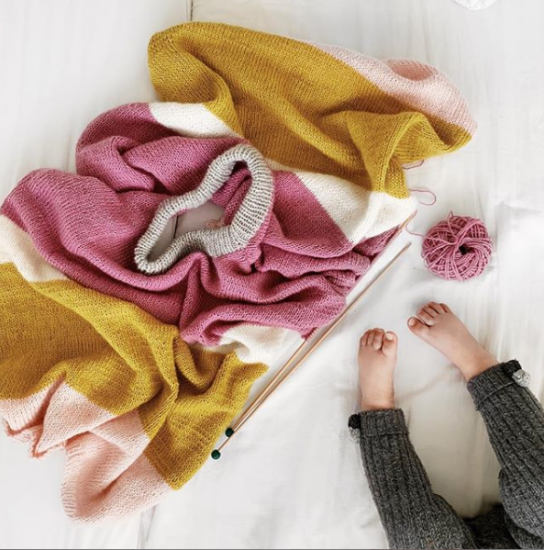 The Mini Me Cashmere capsule consists of a Kit for mothers (available in 3 sizes) and a Kit for children from 6 months to 5 years! But let’s discover together who is Kat (Katharina) and how her passion for knitting was born, with a short interview in our series of “Instagram Maker”! I first learnt to knit when I was 12 or 13 – my auntie taught me the basics one summer holiday. After the holiday was over, I forgot about knitting for many years. I decided to start again after my daughter was born. I loved to sew, but she always wanted to be in my arms and it was impossible. I used to get very frustrated as I really felt like I needed a creative outlet that was compatible with holding a sleeping baby so I decided to take up knitting again. I was very scared of knitting patterns – the ones I saw in magazines and books seemed to be knit in a different language and I didn’t even know where to start. I decided to start slowly… I found patterns written in a simple and understandable way, like those of Bettaknit and from there I did not stop anymore. Everytime I get stuck, I use google and YouTube – there’s always a blog post or a video to help me out! What are you looking for while choosing the yarns to knit? I only like knitting with natural fibres, not acrylic so this is the first thing I look for when choosing yarn. Especially when knitting for my daughter’s I also check that the yarn isn’t itchy- otherwise what I knit will never get worn! I also prefer to spend a bit more money on wool. Expecially when I know it has come from animals that are well cared for and humanely sheared. What did impress you more about Bettaknit? I was very impressed by the quality of the yarns I received from Bettaknit – seriously the softest I have ever knit in my life (ed: Kat received our Biologica yarn and our Cashmere! I also love how supportive you have been on social media – brands such as yours are so fundamental in the creation of a community of makers and knitters. What’s the cloth you like to knit most? It really depends on the season, in the summer I prefer to knit cotton and in the winter, wool. I love all types of yarn. I like to have different projects in different yarn thicknesses and compositions on the go at the same time – that way I never get bored! Would you like to tell Bettaknit’s followers something special? Never be scared of trying out something new or difficult. I still find that I sometimes read a pattern and don’t really understand it until I start knitting it. Be brave – the most challenging projects are also the most rewarding ones! 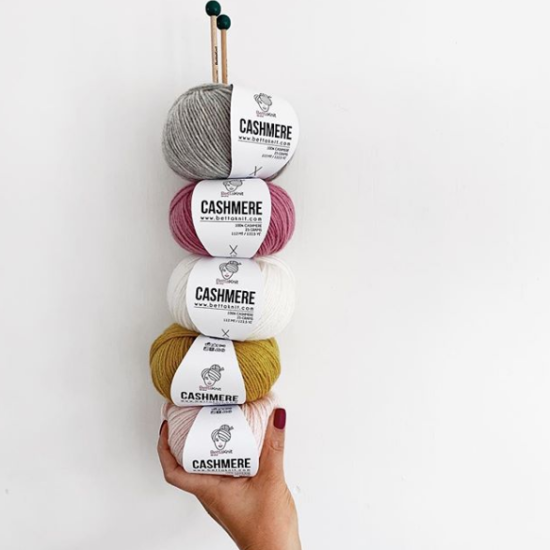 Thank you Katharina for your kind words and for the fantastic Mini Me Cashmere collection: find here and here on Bettaknit store!